The new VW Passat aut. is a four-door coupe with a remarkable vision and very smooth shapes. Car rental choice for family vacation, or business travel. The car is very comfortable and preferred sedan, convenient for both city and extra urban trips. It has an air conditioner, integrated GPS navigation system, high-tech features so the passengers can feel relaxed and to enjoy their trip. 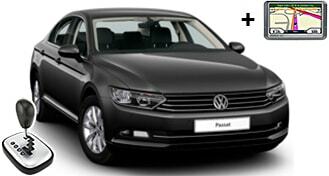 VW Passat with automatic transmission is great for up to 5 passengers. The trunk is big enough for several suitcases. Besides all, VW Passat aut. has a 2,0 liter engine with 170 hp, but it has low fuel consumption - great advantage for its class.